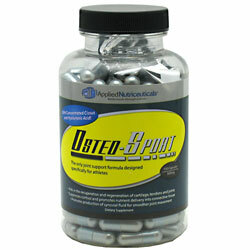 Applied Nutriceuticals Osteo-Sport On Sale! With concentrated Cissus and hyaluronic acid! The only joint formula designed specifically for athletes. Aids in the recuperation and regeneration of cartilage, tendons and joints. Suppresses cortisol and promotes nutrient delivery into connective tissue. Promotes productions of synovial fluid for smoother joint movement. (These statements have not been evaluated by the Food and Drug Administration. This product is not intended to diagnose, treat, cure, or prevent any disease.) ----Joint-Glide Mobility Complex (Proprietary Blend): Bromelain (2000 GDU), Cetyl Myristoleate 20% (CMO), Curcumin 95%, Hyaluronic Acid, Bioperine (95 - 98% Piperine). Cgc2 Joint Regeneration Matrix (Proprietary Blend): Cissus Quadrangularis (40% Phytosterols), Ascorbic Acid (Vitamin C), Glucosamine Sulfate, Chondroitin Sulfate 90% (Chinese Bovine), MSM (Methylsulfonylmethane). Take once daily or in two divided doses with fluid. Daily consumption not to exceed six (6) capsules. Suggested Dosage: Up to 175 lbs: 3 Capsules. 175 - 225 lbs: 4 Capsules. 225 lbs and over: 5 Capsules. Store at room temperature and avoid excessive heat. This product is only intended to be consumed by healthy adults 18 years of age or older. Before using product, seek advice from a physician if you are unaware of your current health condition or have any pre-existing medical condition including but not limited to: high or low blood pressure, cardiac arrhythmia, stroke, heart, difficulty urinating due to prostate enlargement or if you are taking an MAO-B inhibitor or any other prescription or over the counter medication. Do not use if you are pregnant, nursing, prone to dehydration or exposed to excessive heat. Discontinue use and consult your health care professional if sleeplessness, tremors, dizziness, nervousness, headaches, or heart palpitations occur or if you experience any adverse reaction to this product. Do not exceed recommended serving size. Before beginning any weight loss program, consult your health care provider. Do not use if inner safety seal is broken or missing. Keep out of reach of children.